Boiling Springs, SC, (January 26, 2017): The Upstate Family Resource Center celebrated its 10th birthday in January with previous board members, current directors, staff, partners and volunteers. Dr. Scott Mercer, Superintendent of Spartanburg County District Two, shared, “I am proud of leadership and the direction that the Center has taken in helping families become self-sufficient. It is a valuable part of our district.” Dale Lockamy, Board Member, shared that the current board plans to establish and endowment at the Spartanburg County Foundation to begin building for the future success of the organization. 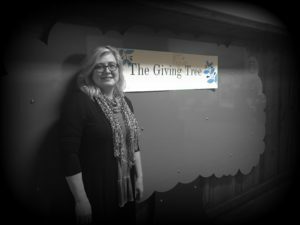 Also, Executive Director Kelley Ezell unveiled a beautiful “Giving Tree” which is placed in the main hallway of the Center. This tree will be used to commemorate gifts given in 2017. Kelley said “This is a great way to give a gift that will have an impact into the future. It’s also a great teaching tool to help your children and grandchildren learn to give.” The Community is encouraged to give throughout the year, donations in honor or memory of someone’s birthday. These gifts will be matched 50¢ on the $1.00 up to $5,000 because of the generosity of AFL and Contec, Inc. If you are interested in making a donation to the Center you may go to their website: www.upstatefrc.org or drop by the Center to pick up a Giving Tree brochure. Founded in 1984, AFL is an international manufacturer providing end-to-end solutions to the energy, service provider, enterprise and industrial markets as well as several emerging markets. The company’s products are in use in over 130 countries and include fiber optic cable and hardware, transmission and substation accessories, outside plant equipment, connectivity, test and inspection equipment, fusion splicers and training. AFL also offers a wide variety of services supporting data center, enterprise, wireless, and outside plant applications. Headquartered in Spartanburg, SC, AFL has five locations in the upstate and nearly 850 associates. AFL also has operations in the U.S., Mexico, Canada, Europe, Asia and Australia, and is a wholly-owned subsidiary of Fujikura Ltd. of Japan. For more information, visit www.AFLglobal.com.